Danni is among other things a vegan, computer programmer, environmentalist living in Melbourne who blogs at crosslegged on the front lawn at Dreamwidth, where this post was first published on 2012/01/15. The Ada Initiative, a group promoting women in open source and open culture, had their first AdaCamp in mid-January. In order to save some money, and because I like food to be inclusive for everyone, Brianna and I volunteered to do all the baking ourselves. There were requirements for vegan, gluten-free and fructose-free. 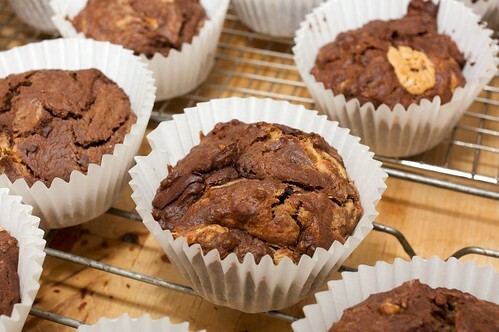 This is what we baked, and the order we baked in to prevent cross-contamination of allergens. I’m a bit paranoid when it comes to gluten-free baking when I don’t know how intolerant someone is. I rewashed everything I was going to use in hot water with a new sponge before starting. You also want to use things like margarine that doesn’t have bits of toast in it. I made this comment on my blog the other day, but reliable information on the Internet about what you can eat when fructose free is swamped out by utter garbage that seems to contradict the truth. In the end I read some articles by Sue Shepherd, who seems to be the expert, plus this datasheet and designed a recipe myself. Glucose syrup is not as sweet as sugar, and the Internet suggests a 2:3 ratio when substituting sugar for glucose syrup. I made everything as a double batch, so I actually ran out. The result being these weren’t really sweet enough. I probably could have cut a bit of white sugar in (most people with fructose malabsorption are ok if there’s more glucose than fructose), but I wanted to play it safe. Glucose syrup is also weird to work with. It’s really viscous. Like, more viscous than treacle. More like peanut butter. I held the jar upside down for a bit and nothing came out. Ended up having to microwave it and use a spoon. Messy. I feel like I nailed the texture of these muffins. I’m quite happy with that. I used plain flour because that’s what I bought, and then cut it with extra baking powder at 2 tsp/cup flour. This recipe makes about 10 on a single batch. I used another of Steph’s recipes to make these. Made by the book. They were a little more stogey/gluey than I would like. I suspect the addition of soy flour was possibly unrequired with the White Wings GF flour. Used frozen blueberries, leaving them frozen makes them easier to stir in without them bursting and turning your batter blue. Originally, I was going to make this recipe but I realised I’d forgotten to by any jam to top them. So it became peanut butter and cloudberry jam (that’s what was in the house). Recipe almost entirely as is, but with about a cup of peanut butter stirred in at the end, and no jam to top. Somehow I never took a photo of this (sad). Something I love about the Sydney Rd grocers: you can ask for overripe bananas and get them. This is great because they’re wasting less food, and you don’t have to think ahead a week to make banana bread. My grandmother has a really amazing banana bread recipe, but I’ve never managed to successfully veganise it (nor did I ever really do it justice in the milk and eggs days) so I decided to use this recipe I found via Google. Worked well, produced a dense but well textured banana bread which was very popular (and my favourite). Made the recipe as is, but substituted soy milk for rice milk, because I had an open rice milk and I didn’t want to have to open another soy milk just because, plus you never know who might be soy intolerant. 350 degrees is in Fahrenheit (obviously), so 180C. Well, I say obviously, it took me a second to realise when my oven didn’t go to 350C. There were about 35 people in total. I made a double batch of everything above. Besides baked goods we served fresh fruit (hooray for Sydney Rd) and biscuits (all vegan, some also gluten-free). Most of the baking got eaten, and a reasonable amount of fruit. Probably would have been perfect had the day been fully attended. Lots of biscuits left over though. Thought people would take packets into the sessions or something. I was wrong. At least they’re in packets. These were all sooo good they made me want to eat vegan gluten-free fructose-free all the time. 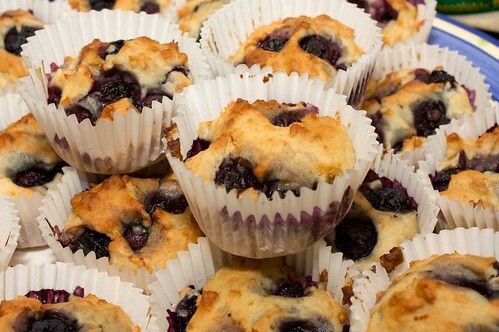 I think the blueberry muffins were my favorite. Banana bread was the best for me. Thank you for the fructose malabsorption links. I’m ashamed to say that I suffer from FM and I had no idea about some of the information in there. 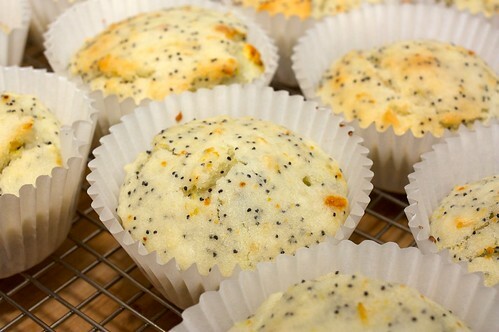 Awesome recipe, They look so yummy. Thanks for sharing! Here is another nice recipe which kids will enjoy making.